This is a beautifully hand colored 1785 map of North America and South America. The cartography of the North America west coast is conjectural at best, with islands, inland seas, and hopeful northwest passages in abundance. The Antarctic regions are depicted in a fascinating configuration of two land masses. A great western continent called 'New Zealand' and an eastern continent called 'Antarctiq,' separated by an Ice Sea. Curiously this conjectural error of Clouet in some ways more accurately portrays the true sub-ice Antarctica than modern day maps. Includes detailed geographic, political, and cultural descriptions of areas the cartographer, Clouet, considered important: The continent, Tierra del Fuego (Terre de Feu), New Zealand, Solomon Islands, The Azores (Acores), and the Cape Verde Islands. 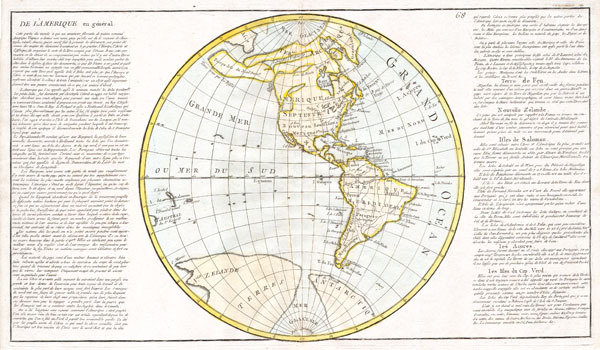 Printed for inclusion in the 1785 edition of J. Clouet's Geographie Moderne. Jean Baptiste Louis Clouet (c. 1730 - 1790) was a French cartographer active in the mid to late 18th century. Clouet, who held the post of Royal Geographer of the Academie des Sciences de Rouen, had offices in Paris and Cadiz. Clouet's most important work is his Geographie Moderne, which was published in various editions from 1776 - 1793. Clouet also produced a series of stunning and highly decorative wall maps depicting the various continents. Fine or perfect condition. Original plate-mark visible. Blank on verso.